Photos and notes about quilting, hiking and drawing. As is my custom, I debated for a while then decided yes I did want to sign up so registered on Thursday. 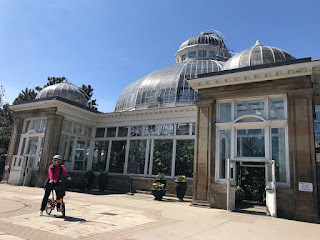 Yesterday was the first class and we met at Allan Gardens in downtown Toronto. I'd never been before and will need to make a return visit. The class was in the children's greenhouse. The talk this week was about cacti and succulents. The first exercise was to study a plant for 30 seconds then go back to the table and draw from memory for 3-5 minutes. The 30 seconds seemed long but when I went to sketch, I found that I'd studied the shape but not counted the leaves or looked closely at how they related from one round to the next. I did get all the blocks and other components assembled and put some up on the design wall with a bunch of blue scraps and two lengths of blue to pick what to use as corner stones. The two bottom right ones are the lengths of fabric but I've decided that I'd rather the blues here are also scrappy so I'll use some of the blues I already used in the top. 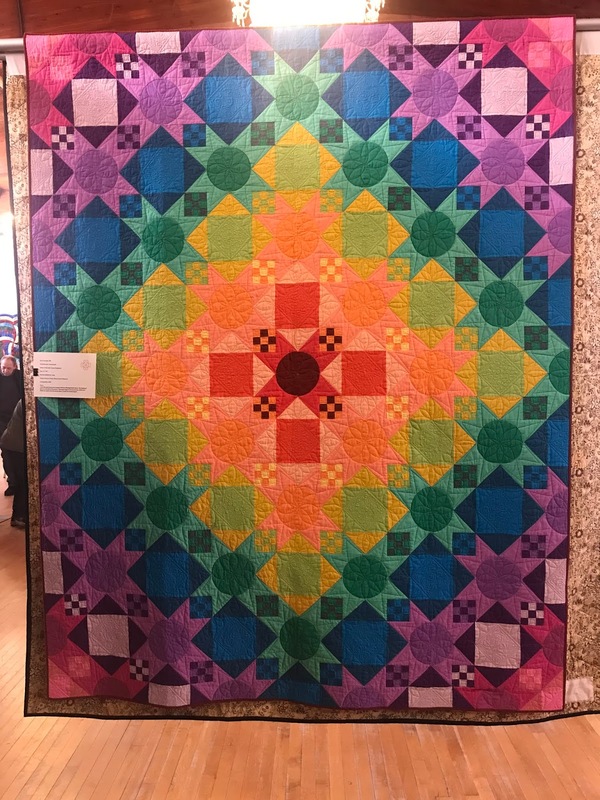 On Saturday I went to the Kindred Hearts Quilt Show in Oshawa with my sister and her friend. 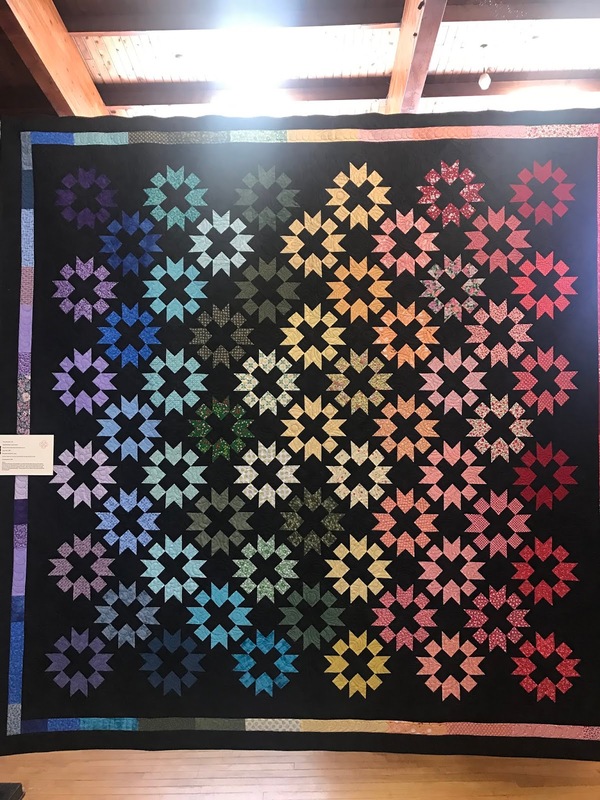 It was a busy show and they had a lot of wonderful quilts. 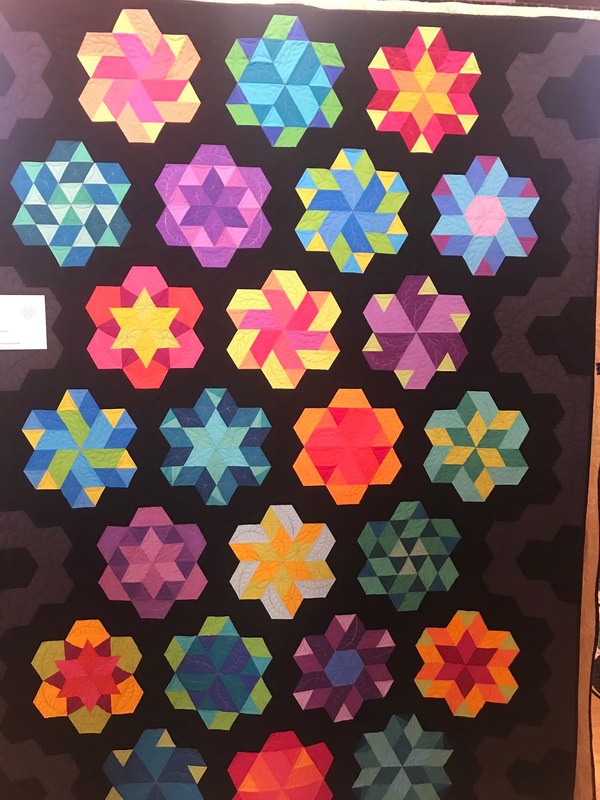 I liked that they hung similar quilts together as its always fun to see the difference colour and value make to the quilt. After we left the show, we were discussing what we had seen. 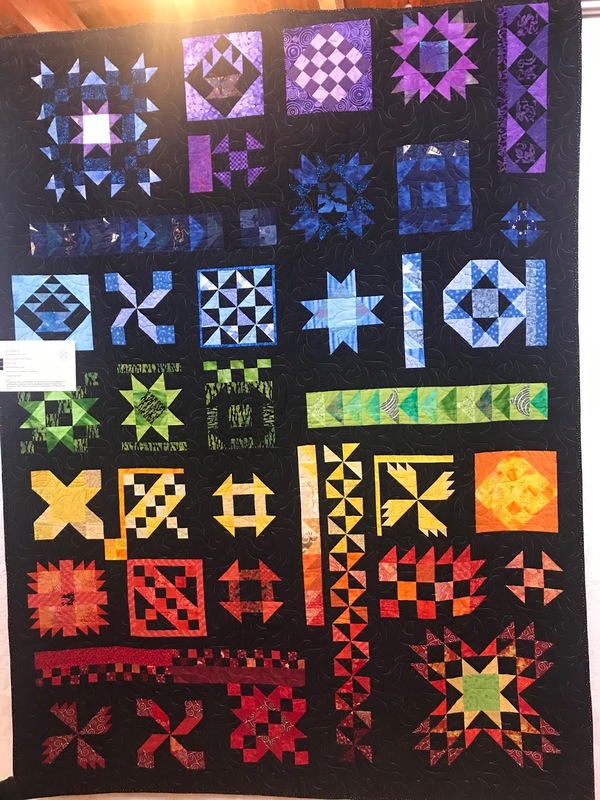 The question was which quilt was your favorite / stood out the most. 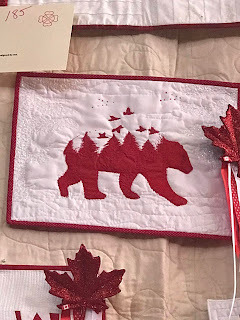 This tiny quilt by Jane Souch call the Spirit of Lucy's Bear was one of my favorites. I love how it blends from the bear to a forest scene. This pair by Nancy Fitz-Gerald and Helma Rollings were fun to see side by side. They used 2.5 inch strips from a guild exchange to create similar pick up sticks quilts. I'm getting back to my quilting so am joining up with One Monthly Goal (OMG) again. 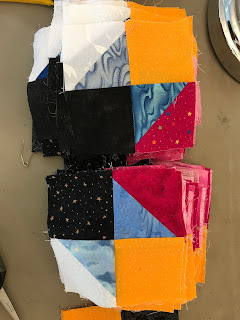 Had a fun time at a guild retreat on the weekend and got all the components for Bonnie Hunter's Grand Illusion Mystery quilt completed and made atleast one of each of the blocks. 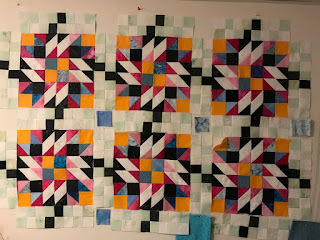 My goal for March is to make all the blocks, the sashing and the border units. Ideally I'd get the top assembled but I'll be happy to have the blocks made. Its been about 5 years in the works. I didn't like the green checker board I made originally and on the weekend they got remade with pale greens. As I mentioned previously a goal the last several years has to been to learn Photoshop. I realized this year that part of my problem was I hadn't really defined what that meant so came up with a high level idea. Through my library, I get access to Lynda.com In January, I watched Julianne Kost's classes on Lynda.com called Photoshop CC 2019 Essential Training: Photography and The Basics. While watching these I realized that I needed to step back a level. I do basic editing in Lightroom, having learned some formulas but I don't understand why they work or what to do when they don't work. I'd like to understand all the panels in the develop modules of Lightroom (or camera raw) and know how and when to use the tools. Then when that still hasn't gotten the photo where I want it, how to continue in Photoshop. Friday I posted about this year, today its about next year.Yvonne is hosting a planning party again.The new year sees a number of changes for me so I’m in the process of planning that as well. Some of that will take a few months so for now I'm focusing on the recurring items. 1. Clean and organize quilt room (and office since they are in the same area). Its gotten so messy, I've no desire to go down there and work on my quilting or anything else for that matter. Last year, I posted goals as part of Yvonne at Quilting Jet Girl’s planning party.The year didn’t go quite as I planned but that's OK.
1. 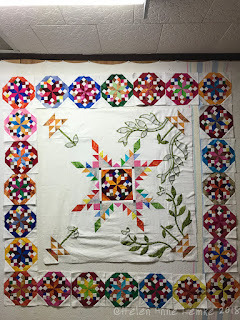 The Motivation Monday worked well when I used it early in the year.I wanted to make progress on Common Bride.The star blocks are done and the centre assembled. I thought I had a photo up on the wall with all the applique done but I cannot find it. The stars still need to be added to the centre. I’ve done some prep work for the next round.I looked at several other quilts but there wasn’t a lot of sewing after the first few months. 2. I only got out to use the long arm machine once this year but did get two tops quilted. 1. Learn Photoshop. This still didn’t happen.I’m beginning to wonder if this is something I really want to do.I’ll probably leave it on the list and try one more time. 2. Tidy up Lightroom. This is still a work in progress. It’s a good thing that you can get a long way when you take enough baby steps.